Preserves fruits, vegetables, and meats fast and easy. The only method recommended safe for low acid foods by the U.S. Department of Agriculture. Capacity: 12 half-pints, 10 pints, or 7 quarts. Extra-strong, warp-resistant aluminum for fast, even heating. Easy-to-read dial gauge for accurate pressure control. 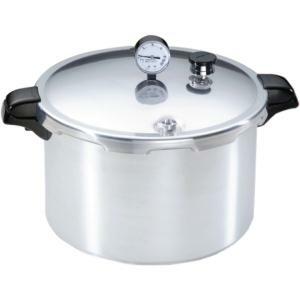 Doubles as a large capacity pressure cooker.